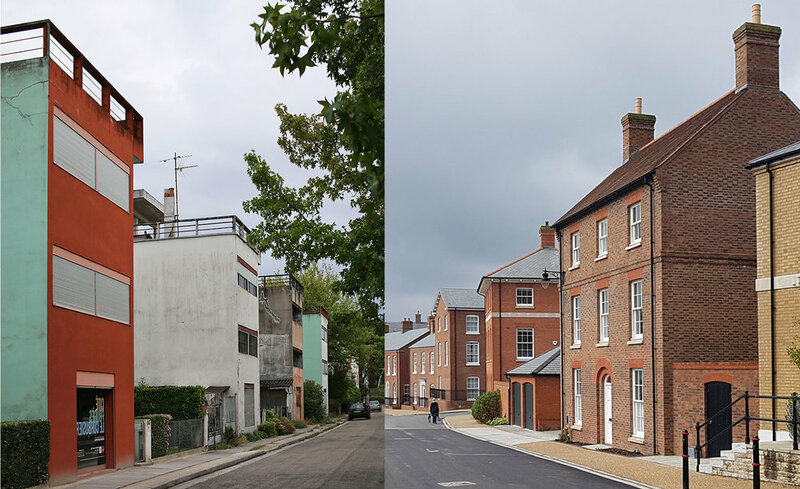 On the recent Architecture Foundation visit to Poundbury, Prince Charles' urban extension to Dorchester, the question came up of whether there is a similarly successful or ambitious development built in a Modern or Contemporary style. One that sprang to mind is the Cité Frugès housing completed in 1926 in the Bordeaux suburb of Pessac to the designs of Le Corbusier. Only 51 houses of the planned estate of 200 were built, so its scale is much smaller and there are no functions other than housing, but the comparison with the typical residential areas of Poundbury is interesting. I went to see it last summer and the thing that struck me most were the gardens and verdant streetscape which I would suggest deserve equal billing with the architecture. 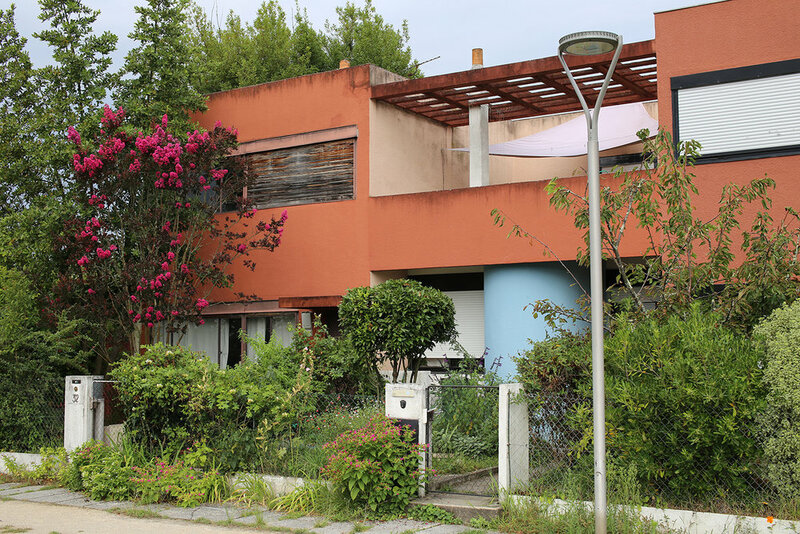 The houses were commissioned by the industrialist Henry Frugès, who had read Le Corbusier's book Vers Une Architecture and offered him the opportunity to realise his vision in a garden-city development to house workers from his sugar refinery. Reaction to them was mixed so the estate was not completed and several fell into disrepair or underwent some aggressive modifications, but their fortunes started to improve after one house was renovated and declared a historic monument in 1980. The local council of Pessac have a very good description (in French) of the different housing types here. Site plan with houses actually built in red. Sketch by Le Corbusier showing the houses set in a landscape of gardens and trees. Modern housing estates can be repetitious and banal but the Cité Frugès could not be accused of either. Each street has a clear building line, except one short length where two houses have projecting wings, and the houses are oriented orthogonally, but they are spaced out with gardens in between, so the rhythm of the buildings is broken up by different garden treatments and the forms of the houses themselves. Most of the houses are set back from the street, except the 'Gratte-ciel' type that come up to the pavement line (photo above). At Poundbury the houses step back and forth in a picturesque manner with varying roof heights, and the streets are slightly cranked or curved to create the impression of a town that has evolved organically. Both achieve a similar level of interest and individuality for the buildings but through different means. 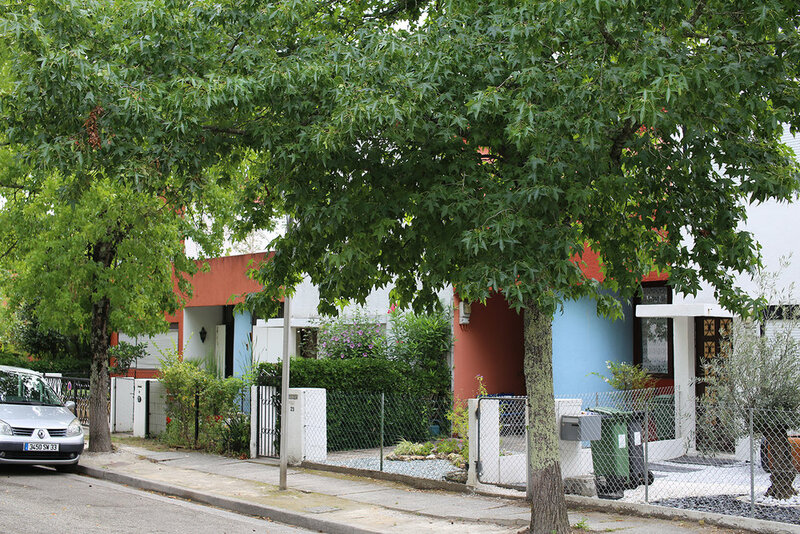 Le Corbusier envisaged the houses at the Cité Frugès sitting in a landscape of trees and gardens which have matured well after 70 years, and many have a relaxed, dishevelled look. Street trees and the variety of planting in the front gardens make the estate feel lush and varied, with lots of opportunity for the owners to create privacy and useful spaces that suit their needs. 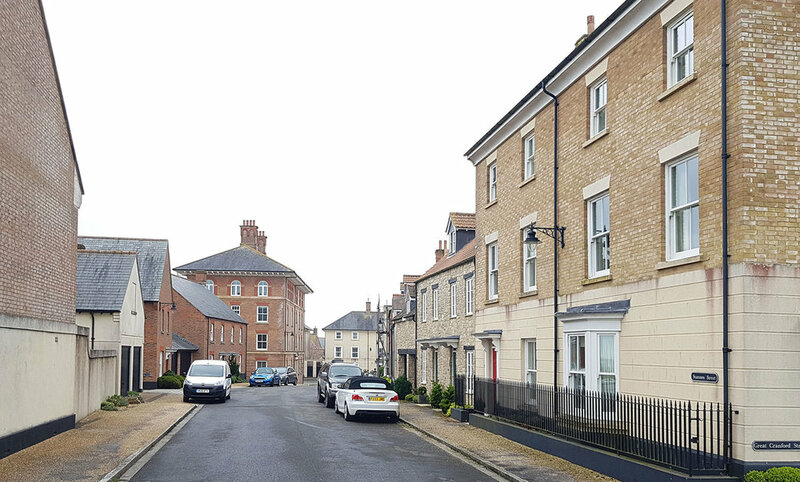 The opportunity for such individual expression, and neglect, has been all but designed out at Poundbury, with only thin strips of planting between the houses and the pavement. All the house types at the Cité Frugès include covered outdoor spaces, either double height ground floor yards, first floor terraces or roof terraces. A few of the houses at Poundbury have balconies, and the large first floor terraces along one particular street are fantastic, but most just have a small rear garden. The principle at Poundbury is to create a dense urban realm with good access to large parks and open spaces while the Cité Frugès is distinctly sub-urban. Colour was crucial to Le Corbusier's vision and is used to break up the mass of the houses and to fine-tune the composition. All the houses are rendered and variety is created by painting different planes or building elements for sculptural reasons rather than to emphasise the individuality of each house. There are some colourful rendered houses at Poundbury but most of the variety comes from the use of varied building materials in the same street, which are likely to weather and age better than the painted concrete and cement render has at the Cité Frugès . Both developments have their qualities but they are trying to do different things. 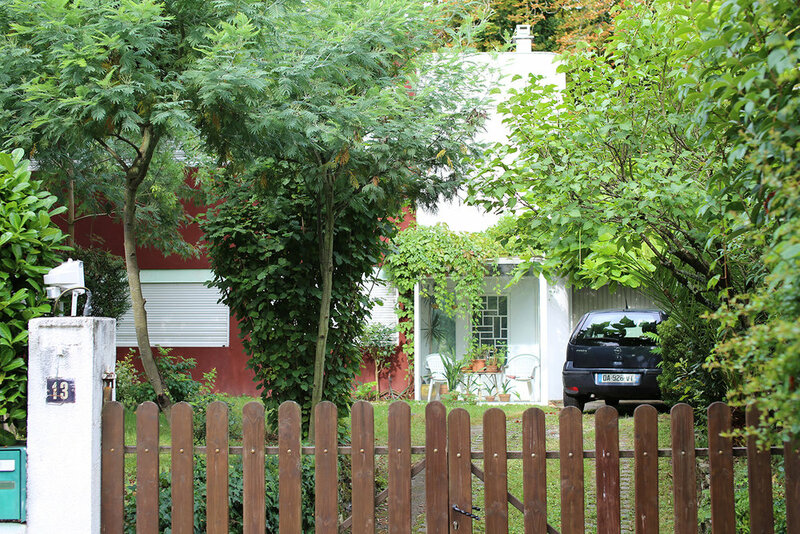 The Cité Frugès houses are mini villas in a parkland, offering the sense of independence and a healthy environment to workers, and not so different from better 1920s sub-urban housing in the UK. Poundbury looks to the garden city model of Bourneville or Saltaire, but is more dense, with private gardens minimised for the greater community benefit of easy access to wider open spaces, employment, shops and services. Perhaps the fundamental difference is in the scope for residents to influence their own environment. Poundbury has strict controls on alterations that can be made to the houses and all residents contribute to a maintenance fund to keep the streets and planting tidy. For some it was seen as sad that the houses at the Cité Frugès had been allowed to be altered, but I think it is positive that the design can absorb changes without affecting the fundamental qualities of the place. The Cité Frugès was made a conservation area (Zone de protection du patrimoine architectural, urbain et paysager) in 1998, so alterations are now controlled. It is the outside spaces though that make the place special. The most endearing quality of the houses isn't to do with style. It is the sheltered outdoor spaces, an integral part of the conception of the buildings that enable the residents to engage with the green spaces around them.